A female prison officer who allegedly caught smuggling marijuana into the New Amsterdam Prison had unsuccessfully begged one of her colleagues not to squeal on her because she has two young children. 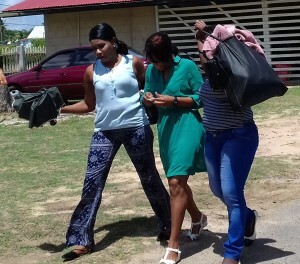 When a bag containing the parcels of ganja, 35-year old Joanna Erskine of 723 Fort Ordnance Housing Scheme was intercepted by one of her vigilant colleagues last Saturday, she bellowed: “Don’t open the bag; don’t do that to me a get two lil children to mine,” Demerara Waves Online News was told. Erskine was Thursday released on GYD$150,000 bail after her lawyer, Tanya Warren-Clements successfully persuaded New Amsterdam Magistrate, Alex Moore partly on the grounds that it would be risky for the prison officer, who has 14 years of service under her belt, to be sent behind bars at a place that she had overseen inmates. The prison officer was charged with being in possession of 298 grammes of marijuana for the purpose of trafficking. Investigators accuse Erskine of collecting a package from someone in a car who had pulled up just outside the penitentiary and taking it inside the prison compound. 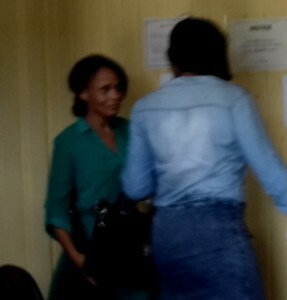 Prison Officer, Joanna Erskine (in green) being escorted by plain clothes police in the New Amsterdam Magistrates’ Court compound. There she allegedly called prisoner William “Tyson” Johnson and asked him to take package containing “biscuits and medication” to convicted prisoner, Mohammed Ally. While Tyson was about to carry out Erskine’s orders, a vigilant senior prison officer observed the transaction and scrambled the package away from him and found five parcels wrapped with brown adhesive tape. The parcels were opened and they were found to contain leaves, seeds and stems that were later confirmed as cannabis sativa. Police and Prison Service personnel said Erskine was nabbed because she had been under surveillance and had been observed to be on her phone frequently before the dark tinted car arrived and she went outside to collect the parcel. Police Prosecutor, Godfrey Playter unsuccessfully opposed bail.